The world's natural supply of underground water, on which two billion people depend, is being run down, according to the United Nations. Water tables are falling by about three metres a year across much of the developing world, according to a study by the UN Environment Programme (Unep). Launching its report on World Environment Day, the UN said governments must take immediate action to reverse the decline. "I hope this report will serve as a wake-up call concerning the human, social and economic consequences of squandering our vital underground water supplies," said Klaus Toepfer, Unep's executive director. Growing populations, industrialisation and more intensive farming are all contributing to a dramatic increase in the use of water. In Arizona, the amount of water being taken from the ground is twice what is replaced naturally, the report says. In parts of the Arabian Gulf, underground water sources are being contaminated by salty sea water pumped from the coast through leaky pipelines to boost city supplies. Developing countries in particular are using up groundwater at what the report calls "an alarming rate". Dhaka in Bangladesh has been tapping into its underground water sources so vigorously that in some places the water table has fallen by 40 metres. New boreholes produce a third less water than 30 years ago, experts say. But the UN says the issue is not getting enough attention because water tables are mainly hidden from view. 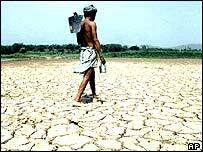 "If a lake, river or reservoir becomes depleted or dries up, the event is highly visible. There is public outcry and often action taken," Mr Toepfer said. "Hopefully [the report's] findings will ensure that underground water supplies are no longer 'out of sight and thus out of mind'." The report says some of the world's biggest cities - including Bangkok, Cairo, Calcutta, London, Mexico City and Jakarta - are dependent on groundwater and should be "prudent" in managing their supplies. The report calls for a more integrated management structure of underground water supplies and for relevant agencies to be given the necessary resources. Communities and those whose livelihoods are reliant on groundwater need to be encouraged to seek alternatives and should be given training and credit for doing so, it says. But first, it concludes, many parts of the developing world need to be better informed of the issue, so they can monitor the crisis properly before it becomes any more acute. "A huge reservoir for the capital Hyderabad is empty for the first time ever"